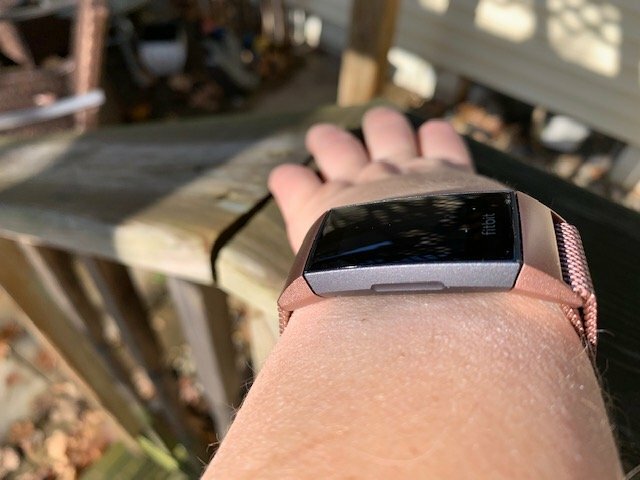 If you have previously read my review of the Fitibit Versa, a smartwatch I have a great fondness for but suffered from syncing issues, you’ll know I’ve had a strained relationship with Fitbit. Although I have to say that the Versa has been much more reliable for me lately, I was still worried how the Fitbit Charge 3 would test out. I am happy to say, after a couple of early updates from Fitbit, the Charge 3 has been performing very well. Woohoo! 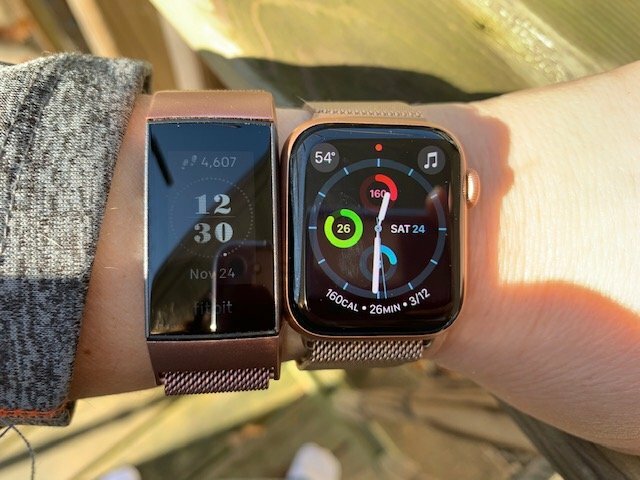 In the following tests I put the Charge 3 up against the Apple Watch Series 4 to compare heart rate and GPS accuracy. I’d already tested out the Series 4 and knew it was pretty darn accurate. And if you don’t want to read through the entire review, the Charge 3 gave me almost identical numbers as the Apple Watch Series 4 for both heart rate and GPS accuracy. What are the differences between the Charge 3 and Charge 2? The main differences between the Charge 3 and Charge 2 are that the Charge 3 is waterproof for swimming and supports swimming as an activity, it is lighter due to its aluminum body, the screen is now fully touchscreen, daily stats are accessible directly on the Charge 3, the Charge 3 supports B (so far the most notable is weather), and the side button is now haptic which means it gives a vibration when pressed. The button was changed to be flush with the side of the tracker to make the Charge 3 waterproof. I chose the standard version Charge 3 in black but the photos below show it with a third-party milanese strap I bought on Amazon. The Charge 3 is also available in a Special Edition (see on Amazon) which supports Fitbit Pay and an upgraded strap. I particularly like the design Fitbit uses for their straps. There are buttons on the bottom of the tracker that you push to release the strap. So much easier than pins. A big thumbs up on the design! You can change the look of your Charge 3 fast and easy. I’d go with the third-party straps over the Fitbit replacements. They’re WAY cheaper and probably just as good. Plus, there’s tons of options. The strap shown in this review can be purchased on Amazon. 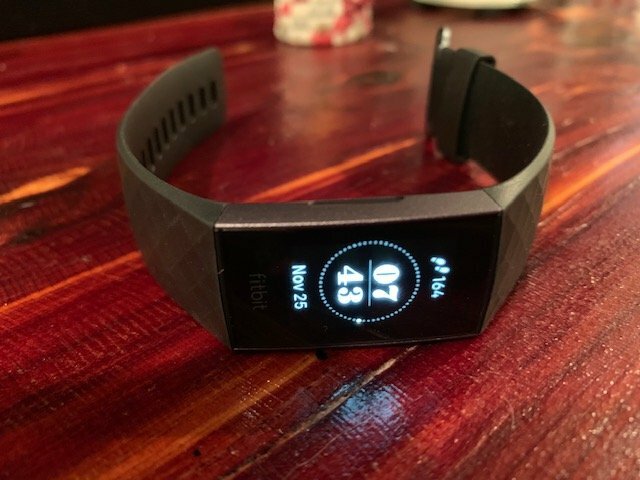 The Fitbit Charge 3 is very lightweight and comfortable to wear but I would advise that you use the right kind of strap with it when working out to get the best data. The strap needs to be tight enough to stay put but not so tight it is uncomfortable. The milanese one shown in this review worked great for me. I did a few tests when using a leather replacement strap but I couldn’t get to position correctly on my wrist. It was either too tight or too loose and therefore the heart rate sensor couldn’t get a good reading. When wearing the Charge 3, or really any fitness tracker, the fit of the strap can make all the difference in obtaining more accurate data and just being more comfortable to wear. 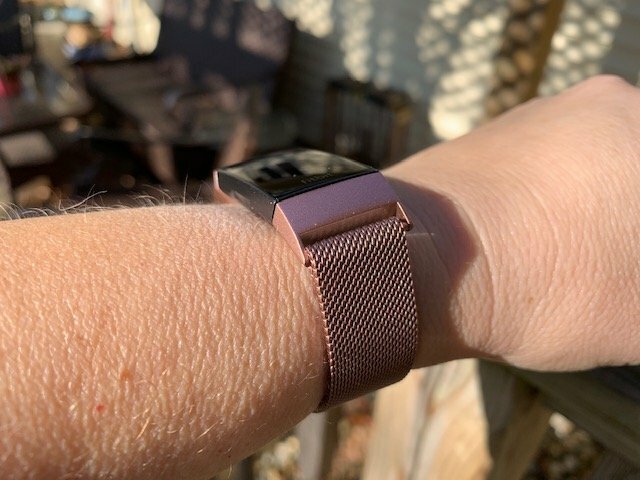 Fitbit Charge 3 with a third-party strap I purchased. Side view of the Charge 3 showing the haptic button. I really like the thin profile of the Charge 3. It’s a simple design but it’s a nice look. And what about syncing and reliably receiving notifications? The first week that I had the Charge 3 I was worried that it was going to be an awful remake of the plot I endured with the Versa. 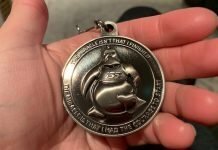 I was actually getting ready to ship it back. Luckily, after a firmware update within the first few days of receiving the Charge 3 (I got it the day it was released) and a couple Fitbit mobile app updates, I haven’t had any issues with connectivity since and it’s been over a month now. So far the Charge 3 has been much more reliable in both syncing and receiving notifications from my phone. Hopefully, the connectivity issues don’t come back. The Charge 3 is able to measure a number of timed activities. Your heart rate will be continuously recorded as well as an estimate of how many calories are being burned based on your age, gender, weight, heart rate and whatever else Fitbit uses in their particular algorithm. In many of the studies that I’ve read concerning calorie burn accuracy Fitbit usually scores well. I’d like to see some updated studies though since most of them are a few years old and fitness trackers have come a long way since then. Generally speaking though, the estimates I’ve been seeing from the Charge 3 seem reasonable which is important if you’re trying to lose weight and using your Fitbit with MyFitnessPal or a similar calorie counting app. Another problem I had experienced with the Versa was the accuracy of the connected GPS and this all stemmed from those darn connectivity issues. Many times while recording an outdoor activity on the Versa, I’d look down and see that the Versa was displaying the message “Connecting”. It just would not stay connected to my phone. I haven’t had this issue with the Charge 3 even after several connected GPS tests. It’s been very stable. 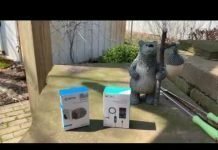 I tested the connected GPS of the Charge 3 first with the iPhone 6 and the tests shown below in this review were with the iPhone XR, since I recently upgraded my phone. The Charge 3 performed well with both iPhones. I haven’t tested it with Android yet but I will be. I’m curious to see if there’s a difference between Android and iOS for Bluetooth issues. When I was testing the Versa last spring I was using it with the Samsung Galaxy S7. I’m going to connect the Versa with my new iPhone XR and see if there’s an improvement. As far as the distance estimates of the connected GPS they appear to be just as good as the built-in GPS of the Apple Watch Series 4. Fitbit Charge 3 Connected GPS test estimated 1.33 miles. The Apple Watch Series 4 estimated 1.32 miles on the same hike. So far I can give give a high grade to the connected GPS of the Charge 3. Btw, connected GPS means that the Charge 3 uses the GPS on your phone to estimate your location and distance traveled. That’s why it’s so important to have a reliable and strong connection between your phone and Fitbit during outdoor activities. In contrast, the Apple Watch uses its’ built-in GPS so you can leave your phone at home. I hope the next version of the Charge 3 and Versa has built-in GPS. It’s way past time for Fitbit to include that on all of their fitness trackers. If you’ve read my other reviews you know this is another feature that I always test thoroughly. I’m super picky about HR accuracy on a fitness tracker. I’m happy to report that the Charge 3 did great in every test I threw at it, once I was wearing the right kind of strap as I mentioned earlier. It really does make a big difference. The first test is between the Charge 3 and the Apple Watch on the treadmill. Charge 3 indicates that my average heart rate was 119 and the max was 147. The Apple Watch Series 4 estimated my average HR was 120 and max HR was 147. The next comparison was during the same hike as above during the GPS test between the Charge 3 and Apple Watch. Charge 3 estimated average HR of 101 and max HR of 121. The Apple Watch Series 4 estimated average HR at 101 and max HR at 123. So as you can see from the results above that they were very similar. I didn’t notice the Charge 3 ever losing my heart rate or showing any kind of erratic behavior, as in too low or too high of numbers. The results are what I would expect. The Fitbit Charge 3 is one of the most popular fitness trackers on the market. The Charge 2 is or was Fitbit’s best selling device and that is due to positive reviews, a reasonable price, and practical functionality. The Charge 3 is following in the footsteps of the Charge 2. Improvements include a waterproof design for swimming or just greater peace of mind when you’re enjoying outdoor activities. I didn’t discuss step tracking but it also tested well for me. I performed several 100 step tests and it was 99% accurate. Battery life is also good at 3-5 days depending upon how many activities you do. The screen is now fully responsive meaning that you can swipe in different directions to see different menus or data. It’s not the most responsive screen but it does the job. When the Charge 3 was first released many people complained that there was no watch face that displayed the date. Fitibit quickly fixed this and added new watch faces and I hope we see some more. Sleep tracking tested well and is similar to other Fitbit devices. Fitbit really does sleep tracking better than most if not all major competitors. 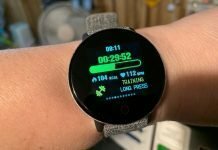 I wasn’t sure what to expect from the Charge 3 after my experiences with the Fitbit Versa. I still want to test the Charge 3 with an Android phone because I’m interested to see if there’s a significant difference. I’m sure many of you use Android. As of right now I’m pleased with the results I got from the Charge 3. I’d like to see some improvements for the Charge 4 when it’s released probably in another year or so, like built-in GPS. I’m happy to see the Charge 3 is waterproof for swimming. That is a major improvement whether you’re going to swim with it or not. It means the Charge 3 has to have a better build quality. So, overall thumbs up to the Charge 3 and thank goodness. Fitbit you redeemed yourself with me.